There are some sins that torment only some of us, while there are others that are universal. Pride is a universal sin. So is anger. And, unfortunately, I’m good at both of these. I do love to be angry. It feels good to be angry at times, and especially when the anger is righteous, or is perceived to be righteous. But, if anger feels good during the moment, it can sure feel embarrassing and shameful when reason has been restored. Because it is so often sinful, anger needs to be overcome. 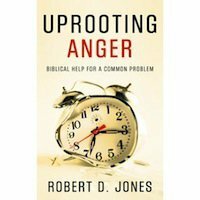 Uprooting Anger, written by Robert Jones, offers biblical help for a common problem. A universal problem, even. “This book is written for the average reader who recognizes that anger is a too-frequent issue in his life and a too-prevalent problem in his family, work, and church relationships…Further, this book provides pastors, counselors, and other people-helpers with a practical Christ-centered resource to guide them in their ministries and to pass on to those they serve.” Jones defines anger as “our whole-personed active response of negative moral judgment against perceived evil.” He goes on to suggest three classifications of anger: divine anger, human righteous anger, and human sinful anger. While we might like to think that much of our anger falls into the second category, the shameful truth is that we are much more prone to fall into the third type. Jones takes the reader through a tour of Scriptural wisdom on the subject of anger dealing with all types of anger and all expressions of anger. He allows no room for pop psychology or what Gary Gilley refers to as “psychological mumbo-jumbo.” He consistently leads the reader to the Bible, to the gospel, to address the problem of anger. He refuses to allow any excuse for sin but sees it for what it is and addresses it accordingly.